In this series of worksheets, students learn about The Romantics. 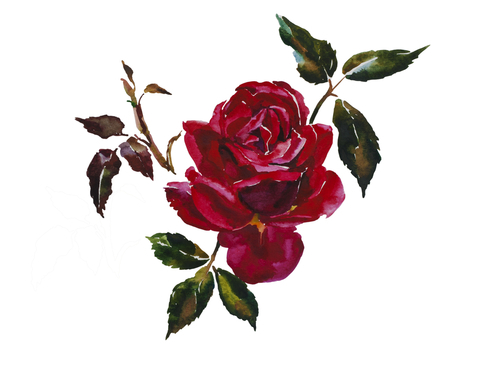 This worksheet focuses on the poem 'A Red, Red Rose' by Robert Burns. This worksheet is part of a series based on the Romantic poets. 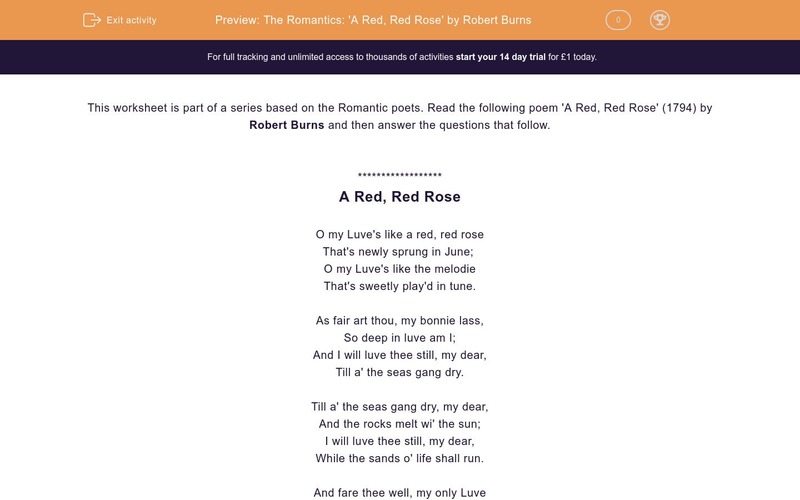 Read the following poem 'A Red, Red Rose' (1794) by Robert Burns and then answer the questions that follow. Robert Burns was a Scottish writer and wrote using Scottish dialect. Match the dialectal words from the poem with their meanings. In the opening stanza the poet uses two cliched images to compare his love to. What are they? What poetic technique does Burns use in stanza one to compare his love? By comparing his love to a rose, what aspect of her is he describing? Reread stanza three and decide on three images to go with it. Choose from the list below. What do you think Burns is saying about his love through these images? That his love will change. That his love will disappear. That his love is strong and will last for eternity. The final stanza has a shift in tone. What do we learn in this stanza? We learn that he is breaking up with his love. We learn that he has to leave his love and travel away from her. We learn that he has met somebody else. This poem was written as a song. What features of the poem suit it being set to music? This poem is written in a ballad form. Research the ballad form and tick the three features that Burns' poem shares with other ballads. It has four lines in each stanza. It has five lines in each stanza. It has an ABCC rhyme scheme. It has an ABCB rhyme scheme. It has a regular rhythm. The poet compares his love to a red rose and a song. Burns uses similes to compare his love. By comparing his love to a rose, Burns is describing her beauty. Images that could go with this stanza are sea, rocks and sun. Through the images in stanza three, Burns is suggesting that his love is strong and will last for eternity. In the final stanza we learn that he has to leave his love and travel away from her. The rhyme and rhythm suit the poem being set to music. Burns' poem is similar to other ballads in that it has four lines in each stanza, it has an ABCB rhyme scheme and it has a regular rhythm.